I‘m compiling my annual gift guide for Serious Eats, looking at cool products for your home bar. 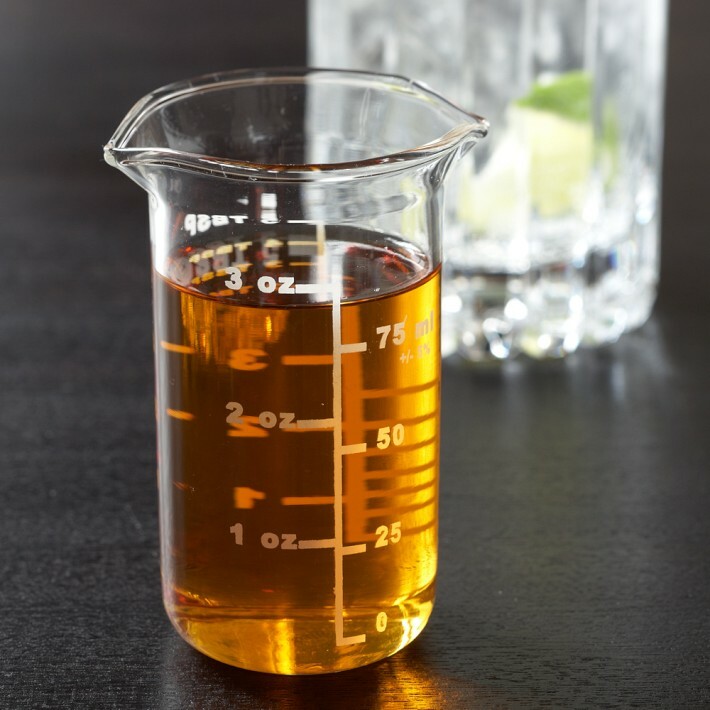 This measuring beaker from Williams Sonoma caught my eye. I love the idea of a product like this. It’s nothing I’d use daily, because of its breakability, but I’d definitely bring it out if we were having a couple of close friends over for drinks and dinner. It’s a great piece for entertaining. Except, look at it closely. Look very closely. See what it lacks, bar geeks. Argh! You’re right! It only measures in full ounces. Need half an ounce of vermouth or other ingredient? Go to hell! You can’t do that with this one! Grump. It’s really cool looking otherwise. I guess if I just wanted a show piece, this would be fine. As a practical tool, though, nope. I have a handful of large, ornate shotglasses that I got from Crate and Barrel that I like for the same reason: each has finely-etched lines for 0.5, 1, and two ozs. also note that the 0 mark is not at the bottom of the beaker. I received one of these as a gift and I use it to prep a second drink if I am making more than one at a time. as a measuring device it is worthless though. Wow. I think I saw that zero mark and tried to ignore it. That’s a mark of a designer glomming onto cocktail culture without taking five minutes to understand it.